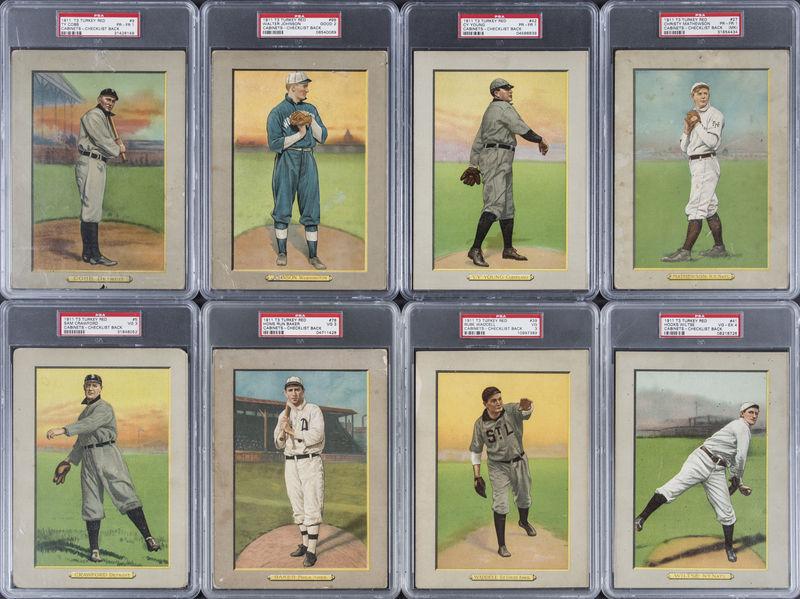 Lot Detail - 1911 T3 Turkey Red Cabinets Complete Set (100) - #6 on the PSA Set Registry! 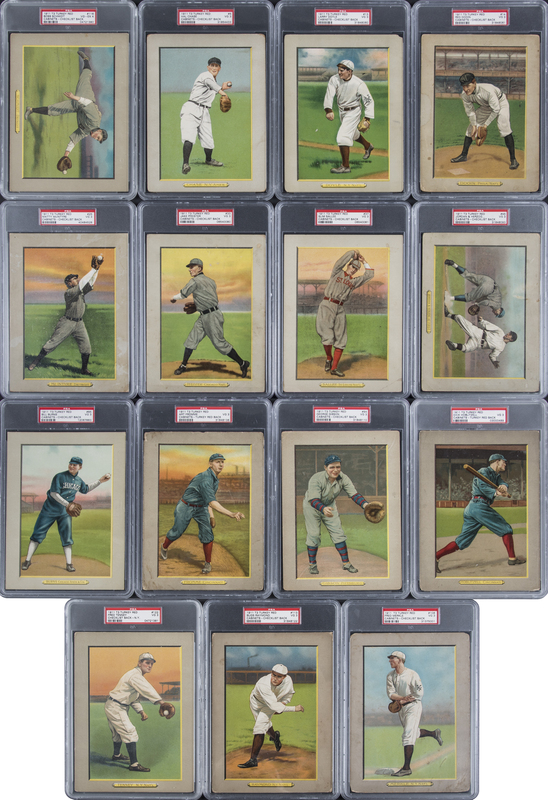 1911 T3 Turkey Red Cabinets Complete Set (100) - #6 on the PSA Set Registry! Each card has been graded by PSA. 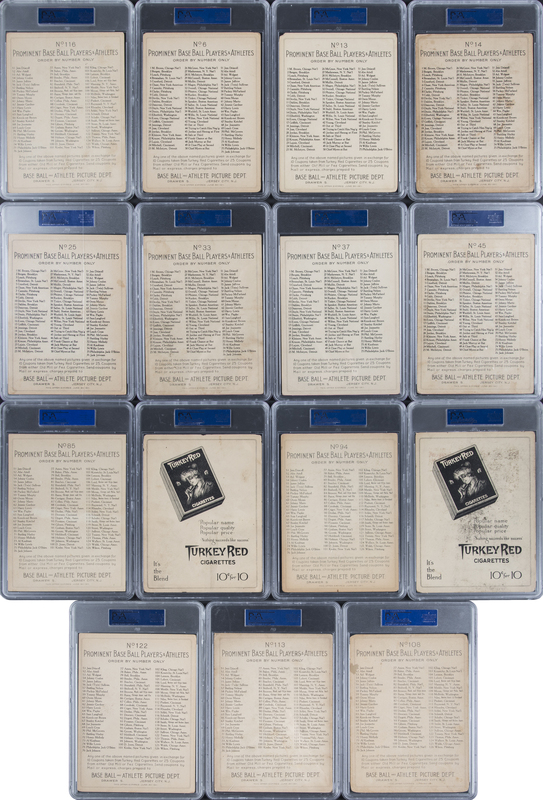 This 100-card complete set of T3 Turkey Red cabinet cards represents the most profound wish of every vintage card enthusiast. With its 1.61 GPA, this assembly merits "#6 Current Finest" placement on the PSA Set Registry! Unveiled in 1910, the public's accessibility to T3's wasn't especially prohibitive. Nevertheless, the cabinets' availability today, as compared to contemporary tobacco insert cards, pales dramatically. 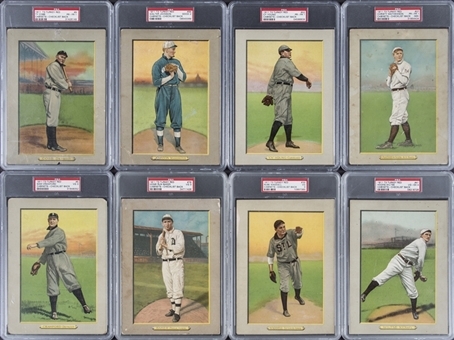 Noting such a disparity, it can be inferred that the vast majority of standard tobacco cards of that period were, beyond a fleeting moment, essentially ignored. For a time, they littered households and streets alike, but there still rose a nucleus of baseball enthusiasts yearning to immerse themselves in the next level. And it was this determined elite who capitalized on the opportunity to attain these beautiful cards. The procedure was simple enough. In remitting a modest number of cigarette coupons plus a little cash, one could expect to receive a handsome cardboard cabinet—in color, no less. For the most part, the specific fulfillment of these exchanges generally complied with the redeemer's request. But today, we accept that in some instances these were answered with substitutes. The point is worthy of note because it was only natural that the preponderance of orders were highly concentrated in a limited number of favorites. (For his effort in amassing coupons, surrendering cash and then awaiting response, the mainstream collector aspired to capture images of Cobb, Speaker or Three-Finger Brown—and not Red Dooin or Orval Overall.) The upshot of this phenomenon is that there was created a curious (and never to be fully understood) imbalance of then-celebrated stars against those demands for marginal players. There's then one other subtle force at work here. It must be imagined that in light of the duration of this promotion, the cigarettes required to gain any meaningful number of Turkey Reds necessitated the purchase (and consumption) of packs by the number...with an exponent. (An individual collector could have died before getting through the Red Sox.) And so, as our latter-day hobby took form in the 1970s, there were no great reservoirs of T3's; they were isolated in very small numbers, and due to the space that their cumbersome dimension occupied, they were constantly susceptible to dismissal. 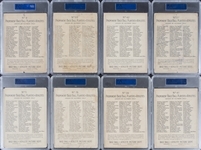 Includes: Graded PSA EX 5: 1 card, #44 (MK); PSA VG-EX 4: 5 cards w/#'s 2 (MK), 21 (MK), 41, 88/Turkey Red (MK) and 116; PSA VG 3: 21 cards w/#'s 5 Crawford, 6 Chase, 13, 14, 18 Jennings (MK), 25, 26 McGraw (MK), 33, 37, 39 Waddell, 40 Willis, 45, 78 Baker, 85, 93/Turkey Red, 94, 97/Turkey Red, 108, 113, 119/Turkey Red and 122; PSA GD+ 2.5: 1 card, #105; PSA GD 2: 24 cards w/#'s 16 Evers (MK), 17 Griffith, 19 Joss, 20, 22, 30, 34, 50, 79, 83/Turkey Red, 86, 90, 95, 98, 99 Johnson, 101 Keeler/Turkey Red (MK), 102/Turkey Red, 104, 106/Turkey Red, 110/Turkey Red, 111 (MK), 115/Turkey Red (MK), 120/Turkey Red and 124 Wallace; PSA PR-FR 1: 46 cards w/#'s 1 Brown, 3, 4 Bresnahan, 7, 8 Clarke, 9 Cobb, 10, 12, 15, 23 Lajoie, 24, 27 Mathewson (MK), 28, 29, 31, 32, 35 Tinker, 36 Speaker, 38, 42 Young, 43, 46, 47 Chance, 48 (MK), 49, 77, 80 Bender (MK), 81, 84, 87 Collins/Turkey Red, 89/Turkey Red, 91, 92/Turkey Red (MK), 96 (MK), 100, 103, 107/Turkey Red, 109/Turkey Red, 112, 114, 117, 118, 121, 123/Turkey Red, 125 Walsh and 126/Turkey Red. PSA PR 1: 2 cards w/#'s 11 and 82/Turkey Red.